Medium and heavy-duty waterproof plastic sheeting options for covering and protecting large objects, floor and ground areas. Ideal for building work, painting and decorating and for use as a waterproof membrane. 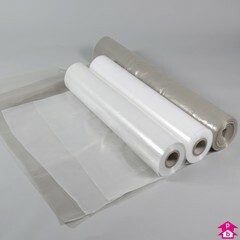 All sheeting is supplied on one metre-wide rolls, with single-fold 2m-wide sheets ideal for easy storage and use or multi-fold 4m-wide sheets for covering larger areas. Commonly referred to as Builders' Rolls because this sheeting is such a staple product for the building and construction industry. 4 Products. Wide sheeting (builders' rolls) available in medium or heavy duty options - ideal for covering large areas in decorating and building environments or using as a waterproof membrane. Made from recycled polythene giving a slightly off-clear colour. 2 Products. 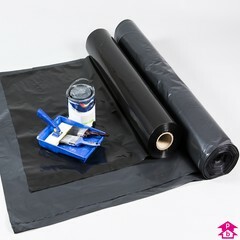 Black wide sheeting (builders' rolls) for protecting surfaces during building or decorating or use as a waterproof membrane. Black sheeting also provides light-proof cover and is useful for both security and heat absorption. 3 Products. Extremely thick (minimum 1000 gauge!) 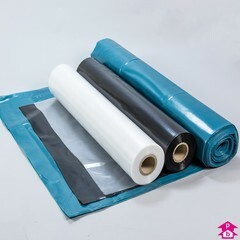 polythene approved by the BBA (British Board of Agreement) for use as a damp proofing course (DPM) or for other waterproofing. Made from recycled polythene supplied as a 4-metre-wide x 25-metre-long sheet multi-folded on to a 1-metre-wide roll. Available in black or blue. 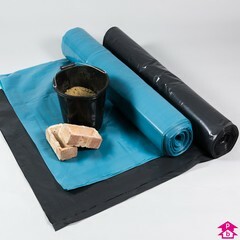 Handypack folded sheet also now available in blue.